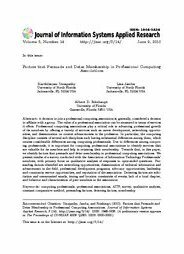 Abstract: A decision to join a professional computing association is, generally, considered a decision to affiliate with a group. The value of a professional association can be measured in terms of services it offers. Professional computing associations play a critical role in advancing professional growth of its members by offering a variety of services such as career development, networking opportunities, and dissemination on current advancements in the profession. In particular, the computing discipline consists of several sub-disciplines each having substantial differences among them, which creates considerable differences among computing professionals. Due to differences among computing professionals, it is important for computing professional associations to identify services that are valuable for its members and help in retaining their membership. Towards that, in this paper, we identify factors that persuade and deter membership in professional computing associations. We present results of a survey conducted with the Association of Information Technology Professionals’ members, with primary focus on qualitative analysis of responses to open-ended questions. Persuading factors identified are networking opportunities, dissemination of technical information and advancement in the field, professional development programs, advocacy opportunities, leadership and community service opportunities, and reputation of the association. Deterring factors are solicitation and unwarranted emails, timing and location constraints of events, lack of a local chapter, and behavior and characteristics of peer members in the association.